In 1964, remarkable relationships between United Methodist clergy and Protestant organizations in Sitka formed the basis for the beginnings of the United Methodist Church of Sitka. 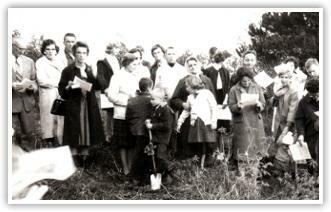 Seven interested people met in January 1964 in the St. Peter's Episcopal "Sitka-by-the-Sea" Parish House and organized the initial survey of the Sitka Community. Four Methodist ministers and three lay people conducted the survey. The survey was followed by visitations to all who expressed an interest in starting a United Methodist Church by the Rev. Ernie Jones of Douglas, Alaska and Rev. Charles Horner of Anchorage, Alaska. Following the home visitations, Rev. Ernie Jones conducted the first church service March 14, 1965 in the home of Ralph and Phoebe Welton with seven people present. The Masonic Temple offered their facility two weeks later on March 28, 1965 for Rev. Richard Heacock to conduct a United Methodist Church service. Easter Sunday, April 18, 1965, twenty-nine charter members were received into membership of the United Methodist Church of Sitka by Dr. Meredith Groves, Superintendent of the Alaska Mission. During May and June 1965, Rev. Fred McGinnis, President of Alaska Methodist University; Rev. Walter Hays, Jr. of Anchorage; Rev. David Fison of Ketchikan and Rev. Ernie Jones of Douglas conducted biweekly church services for the new congregation. The first pastor assigned to the United Methodist Church of Sitka was Rev. John Tindell and his wife, Bee, who arrived July 2, 1965. Rev. Tindell and the congregation initiated the first building fund in March, 1966 with the ground breaking ceremony and the beginning of construction at 303 Kimsham in September 1966. The congregation moved from the Masonic Temple in November 1967 and celebrated a Family Thanksgiving Dinner in the new facility. Dr. Meredith Groves and Bishop Glenn Phillips held the consecration service in the spring of 1968. The multipurpose building served Sitka as church, sunday school, day care center and social hall for over 20 years. Excavation began on the new sanctuary in 1987 under the direction of Harold Campbell with Rev. Thorn Fassett, Conference Missionary Superintendent, leading the consecration in the spring of 1988. Three United Methodist volunteer work groups and local church members reconfigured the roof and added a new narthex during the summer of 1997.